There’s an unknown numbers of data breaches floating around the web. There are data breaches we knew of but they just took years to appear publicly (Dropbox, LinkedIn), data breaches we didn’t know of that also took years to discover at all (Disqus, imgur) and indeed, data breaches that were deliberately covered up (Lifeboat, Uber). But I suspect the another big slice of data breaches are the ones that both the website operators themselves and the general public know nothing about, the “unknown unknowns”, as it were. By it’s very nature, we don’t know how big this list is, but “very big” would be a pretty safe bet. In running Have I Been Pwned (HIBP) these last 4 and bit years, one of the things the constantly amazes me is the breadth of data breaches individuals often collect. People hoard it, swap it, crack it, sell it and occasionally, just redistribute it all publicly. I regularly see these massive lists of breaches belonging to a personal stash, often numbering in the hundreds of incidents and frequently containing data I’ve seen circulating before. Today, however, I came across something a bit different by way of a story from last week titled 3,000 Databases with 200 Million Unique accounts found on Dark Web. Now, as I said only a couple of weeks ago, I’m immediately suspicious when people start saying “dark web”. That 1.4B list I reference in that post, for example, was almost entirely data I’d seen before and it was being distributed via Reddit, “the front page of the internet”. But these things are always worth a look anyway so I set about locating the data. After some number of single-digit number of minutes looking for it, someone pointed me to a well-known hacking forum with a post from 4 days before the story mentioned above. Consistent with my aforementioned “debunking the dark web” blog post, the forum in question is located in the “very clear web” and is easily discovered (although I’m not going to make it any easier here). It then links directly through to 8.8GB worth of easily downloadable data breaches, all obtainable in a single ZIP file. 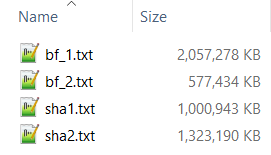 In total, there were 2,889 text files in the archive but it’s what’s inside them which I found particularly interesting. But they didn’t all match, in fact most I tested didn’t. They didn’t all come from the bcrypt files in the Dropbox data either, a bunch were from the SHA-1 files which had no salt. So what can we conclude from this? Well firstly, Dropbox allowed some pretty atrocious passwords at one time there! And secondly, these passwords have almost certainly not been cracked out of the Dropbox data otherwise I would have found a lot more matches (I tested some pretty terrible passwords too). But it does contain email addresses from the Dropbox breach (none of the ones I tested weren’t in the original breach) and we know people reuse passwords so the logical conclusion is that someone has joined email addresses from one source with passwords from another. Moving on, regardless of how the data inside the files was put together, I wanted to get a sense of how many of them were new versus incidents I’d seen before. Any existing breaches in HIBP that I could identify in this new set were omitted. Some of them were obvious, for example Dropbox and MySpace so I pulled these (among a handful of others) out. I then grabbed a unique set of addresses from the remaining data and tested a random 10k of them against HIBP. Only 70% of them were already in the system which indicates a lot of new data; 30% of the addresses I’d never seen before. Of course, of the ones I had seen before there’d still be many addresses in data breaches that weren’t in HIBP and the addresses had simply been pwned more than once, but the checks against the system also gave me an opportunity to do a bit more source cleanup. In analysing the results of the HIBP checks, further duplication came to light. For example, the largest remaining file after my initial cleanup was “SGB.net.txt” but the domain sgb.net is presently parked and archive.org doesn’t show anything of substance on it in the past either. But when checking the data against HIBP, I kept getting hits against the Lifeboat data breach . That site runs on lbsg.net which is not too dissimilar to the filename in the set I was dealing with here. The file named “Alpari.com.txt” was full of Chinese addresses and constantly showed hits against the NetEase and Aipai.com breaches. Given that alpari.com is a financial services site located in the Caribbean, something doesn’t add up here so I removed that one as well. It should be abundantly clear from this post, but let me explicitly state it anyway: I have no idea how many of these are legitimate, how many are partially correct and how many are outright fabricated. I’ve consequently flagged this “breach” in HIBP as unverified. However, I can confidently say that amongst this set was a large number of records in breaches that I’ve previously verified and that per the Dropbox example, there are passwords that have been used by the email addresses they’re associated with. I’m conscious that people can be left feeling like they don’t know what action to now take, but when I’ve asked in the past people are overwhelmingly in favour of knowing where their data has been exposed. As with almost every other data breach, treat this as a reminder of how important a dedicated password manager is for ensuring all your passwords are unique and genuinely strong. Read the only secure password is the one you can’t remember for more on that. Finally, if you find your data in this set and recognise the source of it from the list above, do leave a comment below as it may help others identify where their information has been exposed. Edit: For people asking for the source data or passwords, please read No, I cannot share data breaches with you and Here are all the reasons I don’t make passwords available via Have I Been Pwned.